Yojimbo users who want to take their data with them can now do so with a little help from a sidekick. That’s the name of a new feature Bare Bones Software has added in the latest version of its information manager. The marquee addition to Yojimbo 2.2, the new Sidekick feature lets users export most types of data into a portable Web page format. Users can then take the data they’ve stored in Yojimbo and access it from an iPhone, iPad, or other mobile device. “It’s a very quick and lightweight way to get data off your desktop and into your pocket,” Bare Bones founder and CEO Rich Siegel told Macworld. 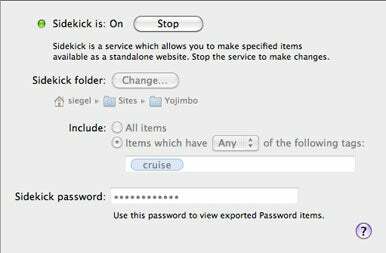 Yojimbo 2.2’s Sidekick feature provides a preference pane, where users can control which items they can export and in what folder that content gets placed. Users can export all of their Yojimbo data, though most users will want to use the application’s tags feature to mark the items they want to access on the go. Enable Sidekick, and Yojimbo creates Web pages for all designated items, adding them to a portable index page that can be easily searched. You can then access Yojimbo data via OS X’s Web sharing capabilities or via a cloud-based file-sharing service. A number of devices can take advantage of the new Yojimbo feature, including the iPhone, iPad, Android-based smartphones, and netbooks. There are some limitations to what you can export with Yojimbo 2.2’s Sidekick feature. The application can’t export Web archives due to technical constraints, and the release notes for version 2.2 say that putting an export on Dropbox and browsing through that service’s Web interface won’t work at this time. Bare Bones hasn’t announced any definite plans for making mobile apps for Apple’s handheld devices, and Siegel declined to do so Wednesday. “We’re not making any announcements or promises” about future mobile development, he said. The addition of Sidekick wasn’t the only change introduced in Yojimbo 2.2. The update also added a flexibly sized comments field, and the new version now places the top search result into the application’s find pasteboard. Version 2.2 introduces several small bug fixes as well. The update is free to all registered users of Yojimbo 2.0 and later. The application, which runs on Mac OS X 10.5.7 or later, costs $39; a family-pack license for up to five users costs $69. Earlier users of Yojimbo can upgrade to version 2.x for $20.